I'm trying to lock my workstation but when I look for one or Google for any other buttons/keyboard shortcuts, either none of them work or they are not present on my screen. I don't see any options besides logoff, shutdown, restart, standby. Resuming from standby does not lock the workstation either. I've been Googling for like half an hour now and nothing works. How can I lock my workstation without logging off completely? Or you can get a Keychain Lock in your menubar. There appears a lock in your menu bar. Click on it and choose 'Lock Screen'. 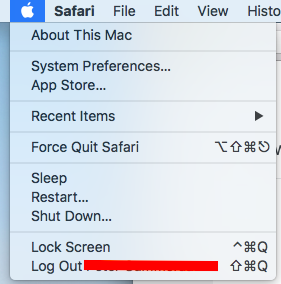 Go to System Prefs, and require a password to turn off screensaver. Set the time period for requiring the password to "immediately". Set a hot corner to trigger the screen saver. Then, you would move the mouse to the hot corner to 'lock' the screen, requiring a password to unlock it. Alternatively, under Users and Groups, turn on the setting to display the Fast User Switching menu in the menu bar. From that menu there is an option to display the login window. This will lock the machine, requiring a password to get back in. Not the answer you're looking for? Browse other questions tagged macos password login login-screen .